Eastland Made in Maine emphasizes a classic collection of men’s shoes exclusively handcrafted in the USA. 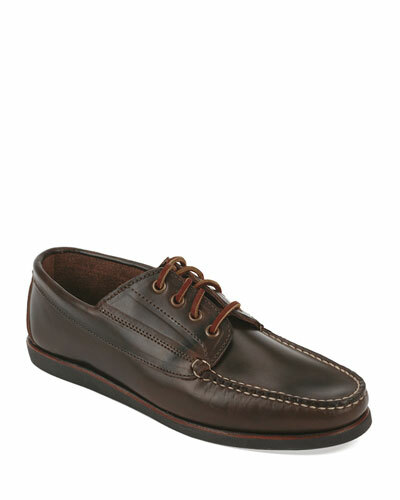 Eastland boots and boat shoes sport a genuine moccasin construction that is completely stitched by hand. Each pair bears a consistent quality and is stitched using the finest of raw materials by experienced craftsmen. 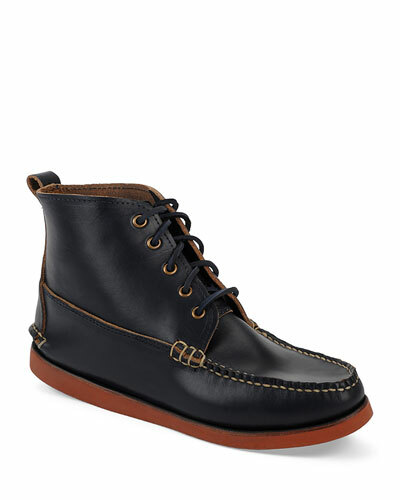 The collection also includes heritage and timeless styles such as chukka boots, boat shoes, and lace-up moccasins. Shop Neiman Marcus’ fine selection of Eastland Made in Maine shoes in a variety of styles. Ermenegildo Zegna penny loafer in calf, lamb, and goat leather. Tapered apron toe. Penny keeper strap across vamp. Brogue details at heel counter. Comfort rubber outsole. Flat stacked heel. Slip-on style. "New Flex" is made in Italy. EXCLUSIVELY AT NEIMAN MARCUS Magnanni for Neiman Marcus burnished leather loafer with penny keeper strap. 1" stacked heel. Square apron toe. Notched vamp. Leather lining and sole. Slip-on style. Made in Spain. Swims loafer/boat shoe featuring 3D-molded TPU structure. Antibacterial mesh liner and vamp for ventilation and drainage. Moc toe with tonal topstitching. Braided ties with 360-degree lacing. Non-marking natural rubber outsole. Slip-on style. Machine washable. Imported. Smooth calf leather penny loafer by Tod's. Notched vamp with penny keeper strap; embossed logo. Round, plain toe. Leather lining and footbed. Signature Gommini pebbled rubber sole and heel guard. 1" stacked heel. Made in Italy.